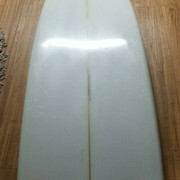 For sale is a handshaped 7'4" Malwitz single fin pintail surfboard. Beautiful board in mint condition. Minimal if any pressure dents, no repairs. 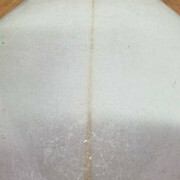 Simple clean board with a grey overlay on the bottom 2/3. 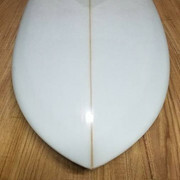 Board glides effortlessly and is super fast on our punchy waves. 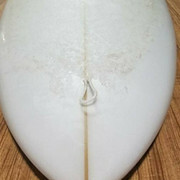 Perfect board for the winter when wearing a lot of rubber in the bigger noreasters or during hurricane season when you want a little more board under your feet. 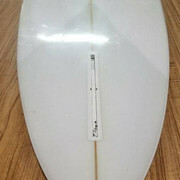 Will also take off nicely on smaller waves, plenty of float and glide available. Bump, would also consider trading for a Fish or Groveler in the 35L range with a potential cash swing on the side. This thing is so purdy! Wish i had the cash for it. Trade for a 7'6" Ricky Carol MiniMe? Barely used. I also have an 5'8" quad disc. Pretty wide and thick but likely less than 35L. Nice meeting you Rich! Let me know when you want to get out to the point!